I have the wifi cooker and have seen multiple posts on this but nothing that really answers my question fully. Lets say I am cooking at 150 degrees, am using a well insulated cooler with lid and have preheated the water to about the 150 degrees. How much water would the wifi cooker be able to keep at that temperature in these conditions. I have read that 5.5 gallons is the max and that you can do more if using a cooler, preheated water, etc. but nothing that confirms the max. Has anyone tested this? I just got into this, second cook is tonight, but am already in love with this. We host Easter and I am already thinking of a big meal to cook, say a roast, individual steaks, or Osso Bucco. I get the meat has to have enough space to allow for good water circulation but would need to know max water volume to then be able to understand what my options are. Thanks in advance! I do not recall seeing anything from Anova on this officially. I think that the unit can easily handle a good sized cooler of water if you have the water preheated. Many here use coolers. Also make sure it is covered to reduce evaporation. FYI hot tap water is roughly 20° below your 150° mark so you have to heat some on the stove to compensate. I have the first 2 Anova models and have used either with nearly 5 gallons of water in a Cambro container for 48 hour cooks with no issues. I have not had a need to go any larger. To do the calculations you need to know the heat loss and dimensions of the cooler. I honestly do not think you will have an issue. Do a search for coolers used fro Sous Vide to get an idea of those others have used. Here is what I use fro bigger cooks. Sean, i recall that at one time Anova stated the capacity of the model at that time was a conservative 5 U.S. gallons. Now they use a rather imprecise " 8 meals". With all the variables in play with water bath cooking i get a headache thinking about what the maximum practical volume could be. In the current state of the art with well insulated Cambro containers and snug lids the capacity must be considerably more. However every rig might have slightly different thermal retention factors which influence capacity. If you know your precise rate of evaporation and are proficient in the use of partial differential equations you might be able to re-jig the formula in Baldwin 2008, Part III A, heat transfer model, based on your Anova's output. I've successfully used large Polyscience circulators in 22 Gal. 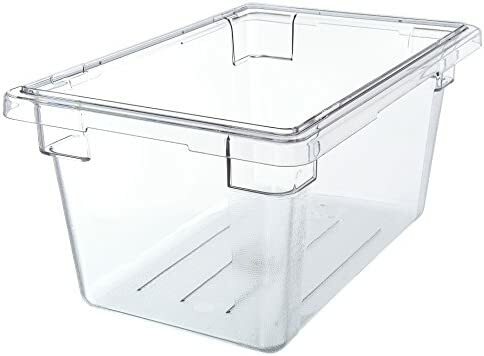 Cambro food storage boxes but that's not a valid comparison. You might want to consider doing several batches for Easter. Also, the typical home kitchen isn't functionally designed to produce commercial quantities of food and that gives rise to potentially hazardous situations.